This Saturday, April 11 the San Diego Derby Dolls are hosting another exciting double-header event at the Dollhouse in downtown San Diego! 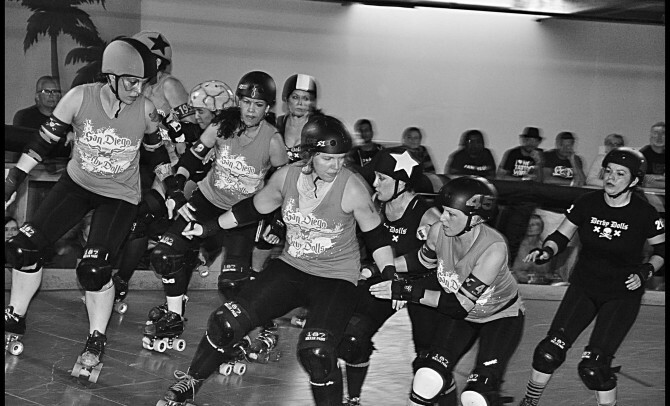 During the main event, the Sparks will face off against the Los Angeles Doll Parts, LA Derby Dolls’ subpool team. The Sparks struggled with LA’s subpool last season, skating away with a 0-2 record. This season, they have worked hard under the coaching of veteran skater Lemon Drop and plan to win with a BOOM! Skating for the Sparks on Saturday will be Blazin Half Asian, Hard Kase, Hedy LaScar, Hit N Run, Karen Bout Nuffin, Killer Groove (Captain), Loni Lethal, Minxy, Pinch A Penny, Reck’em Ralph, Selenium Falcon (Co-Captain), Slay Shawn, Vermillion Valkyr and Zombie Dearest. The first event of the night will be the Juvenile Dollinquents vs. the LA Junior Ri-Ettes. On March 21st the Dollinquents shook up the LA Aftershocks 186-103. This Saturday’s game won’t be a walk in the park for the Dollinquents, though. The Junior Ri-Ettes were the 2014 Battle on the Bank champions and will surely test the resolve of the Dollinquents. Skating for the Dollinquents on Saturday will be Diet Choke No Ice, Fender Bender, Hellanor Rigby, Kay Oss, Kim Kong, Mona Lina, Poison I.V., Raggedy Annvil (Captain), Ric-a-Shea, Ryl’d Up (Co-Captain), Star Wreck, Stiletto, Tiger Lily and Tinkerhell. Doors open at 4:30 pm on Saturday. 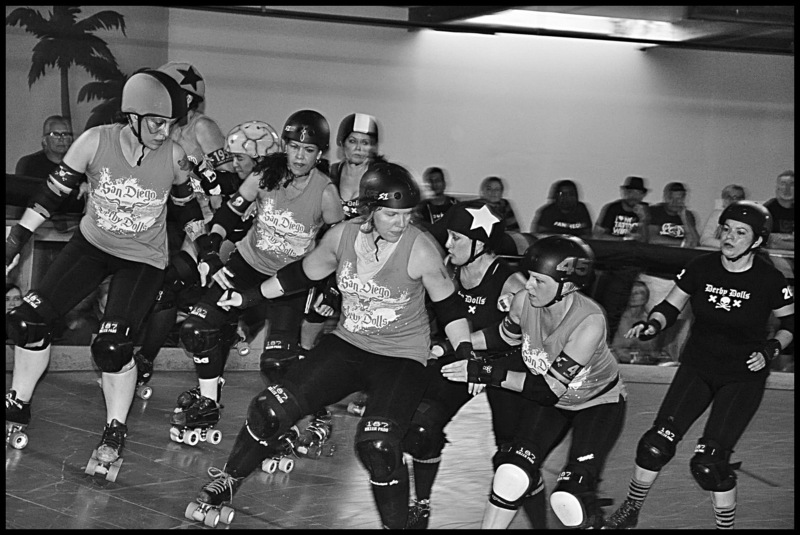 The Juvenile Dollinquents vs LA Junior Ri-Ettes bout is at 5:00 pm and the Sparks vs LA Doll Parts bout is at 7:30 pm. These bouts will be held in our private Dollhouse in downtown San Diego, open to only 200 of our closest friends and family. Street parking is free after 6:00 pm. Don’t forget to arrive early to check out the newest apparel at our merch stand and our vendors in our Vendor Village on the flat track under the disco ball! A concession stand will be full of pizza, popcorn, and soda for all your hunger pains. All ages are welcome and there is free admission to children 5 and under!